Buying or selling a home is suppose to be fun. With the right realtor, it can be. Jenny goes above and beyond for her clients. I trust her with her knowledge and negotiating skills. I will continue to go to Jenny for all my realty needs. She listed our home and had an accepted offer in a month. She helped & communicated with us throughout the entire process. On top of that, she found a rental property for me to move into in a timely manner before closing. I highly recommend Jenny! 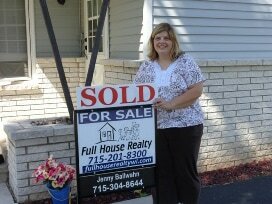 Jenny Ballwahn assisted us in both the buying and selling of a home. Professional, efficient, and honest describe our overall experience. She utilized multiple means of communication in an organized and competent manner. If she didn't know the answer to a question, she researched it. We never felt like we were asking a dumb question or bothering her. We also appreciated the fact that she wasn't negatively assertive; she always kept our personal interests and goals in mind. Jenny's reassurance and optimism were keys to keeping the experience stress-free. We would definitely recommend Jenny Ballwahn from Full House Realty! Jake was absolutely amazing! He became a calm and guiding force for us, as we went through the ups and downs of purchasing our first home. His knowledge and professionalism is something every potential homeowner should seek out. He was there for us every step of the way. From multiple showings and recommendations, to early morning and late evening phone calls and texts, right up until close. If you’ve been searching listing upon listing and you need someone to help you pull it altogether to achieve the quintessential American dream, call Jake today! My experience with Jake was amazing! He brought me through the whole process of listing to selling with ease. He was on top of every detail in a very timely manor and kept me in the know. It was a pleasure having Jake be my realtor! Yes, I would definitely let him find or sell my next home. I recently purchased my first home with Jenny's help. I couldn't imagine better service. Jenny was always there to answer any questions and keep me up to date of what was going on with the home buying process. She is very knowledgeable about every step of the home buying process. She felt more like a friend than a realtor as she always had my best interest at heart. Jenny was highly recommended to me and I can understand why. As a result, I highly recommend her to anyone looking for trustworthy realtor advice. I can't say enough about Jenny, not only was she very professional but she was honest, friendly and reliable. Whatever the situation was, she made the best of it and kept pushing forward. At one point the seller wanted to move closing up by two weeks, and she made it happen! She organized the inspections and "kept the ball rolling" to get the job done. Not only was she great to work with, but she was very prompt and very easy to communicate with. We looked to her for advice multiple times throughout the process, and she was more than willing to help us with whatever we needed. If you are looking for a realtor you can TRUST and relate with, she is your realtor! Jake was very friendly and easy to work with. Jake also responded to all of our calls and texts very quickly and even sometimes very late at night. He explained everything very well and made our first-time-buying-a-home experience very smooth, stress-free, and exciting! I highly would recommend Jenny from Full House realty. She was never pushy to make a sale, she was very patient with me, she got back with me with answers, and had good advice for me. She a good home town girl and negotiated for me I got everything I wanted. Top notch! My loan officer at Premier Community Bank referred me to Jenny. She was amazing! Extremely knowledgeable about the process, very responsive to my many questions. Once she knew what I was looking for she did an excellent job of identifying possibilities. When she didn't know the answer she did the work to get the answer, and kept me in the loop the entire time. I would recommend her to anyone! Jenny made the process of buying our first home super smooth. She was upfront and honest about the few homes we looked at. Very flexible and willing to meet within our schedules. She always kept us updated on the process of the home we chose. And she responded to all our questions in a timely manner. Thank you for making our experience awesome! Jenny was wonderful to work with. She knew the area very well and understood what we were looking for in a home. She was extremely patient with us and stuck with us until she found us the home that exceeded our expectations! Jenny always answered our inquiries on specific homes, questions on mortgage payments, how much taxes would be, etc. within minutes. We couldn’t have picked a better realtor to work with in our house hunting journey. 3 Months, 70 plus houses- Jenny and Jeff remained patient and optimistic that they would find us “the house” to best fit our wants and our needs. During the entire house hunting experience Jenny remained honest, realistic, and driven. Jenny consistently demonstrated a “client first” attitude-not only sharing her ideas with us but also striving to provide us with a successful first home hunt experience. I would recommend Jenny and Jeff to any new home buyer!